Looking for a short term place to call home? Look no further, this large 1100 sq/ft, 1 bedroom, 1 bath home is just what you need. It is large and open giving you a nice calm feeling. Work from home at the desk and gaze at the mountains! This great home is located in Downtown Colorado Springs close to all that the city has to offer! Easily get to the main drag where all the food, bars and shopping are. 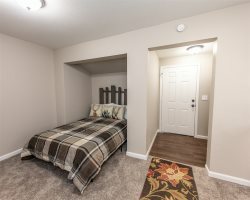 This apartment is also close to hospitals, Fort Carson, and I25, not mention hiking and most of the main attractions here in Colorado Springs.